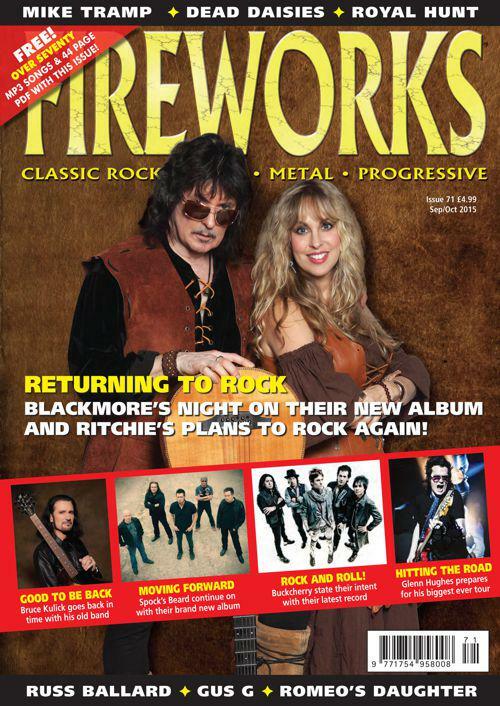 Fireworks magazine has an interview with Blackmore’s Night as their cover story for issue 71 (September-October 2015). They talk about their new album, a bit of the past, and at the end, the future. R: There’s quite a few songs, when I look back, that I think we could have done better. ‘Writing On The Wall’ for definite, that’s probably our worst song. I don’t know what happened with that one. I think we were in a hurry to get out, left it to Pat and he thought we wanted a disco thing. I have to say, I do like ‘Writing On the Wall’, but it’s sound is very different to the rest of the album, it sounds a bit at odds with the rest of the material. R: I think the idea is good, but the finished product is nothing like we wanted. We should do that one again. C: I think what Ritchie explained to Pat and how Pat interpreted it turned out to be two different things, and at that point we needed to be delivering it to the record label and didn’t really have chance to go back and make it what we wanted it to be. However, I’ll probably do something next June, doing all the Rainbow and Purple songs for a few nights, maybe four nights. I don’t know whether it’ll be a festival or what yet, but I’ll pick some people to do those old songs and jam some Rock N’ Roll, that I would find exciting. I won’t know who the singer will be yet for a few weeks. I have a good idea who it is, but I want to try and recreate the sound… there will be a lot of Dio stuff, but he can’t be the singer, obviously. That would have been something! I noticed when I wrote the list of songs I wanted to do, it was a lot of Dio stuff. There was some Deep Purple, and probably ‘I Surrender’ would be in there too, that kind of thing. That’s still in the talking process at the moment, but yeah, looking at doing three or four festivals or shows in June. Hopefully somebody will be interested and turn up. You’re not going to tell me who the singer is when you haven’t got anything confirmed – is it someone you have worked with before, or somebody new? R: Somebody new. I like finding new singers, I like to think I’ve done a good job of that in the past. This issue of the magazine can be purchased from Rocktopia in both dead tree and paperless incarnations. Posted by Nick Soveiko on Friday, August 28th, 2015, filed under News. You can follow comment on this post through the RSS 2.0 feed. You can skip to the end and leave a comment. Pinging is currently not allowed. Sorry…too busy watching To The Rising Sun did…..?????? @1 What a fantastic product the Rising Sun video is. I can’t wait to see negative comments about it and shred them to bits, it’s as good as it gets! Simply crazy! I wish it was Jorn Lande… the only singer that could do Dio stuff properly. Can`t wait! Ian Paice or John Bonham ???? Absolutely 100% Excellent. New singer and lots of Dio era material spells I need to start planning now to go to a show next June, wherever it may be. I’m thinking Joe Retta (Dio’s Disciples and Heaven&Earth with Ritchies pal Stuart Smith) would be the perfect guy to sing. Best Voice in Rock at the moment? Thanks for this article. Is there a link where we can find the whole interview ? well…then he’s 71 years old. Maybe Robert Plant wants to come to the party ? I’d agree about finding good singers. Some of the greatest of all time!!! I have a feeling it will be the European singer Jorn…..
Then again, If Ritchie decided to try a new project, I’d love the following to be in the band…. @15 – Here it is on THS for all to read, there are 17 comments, is the interest he speaks of still there? This was once the biggest Purple fan site on the net, and it still is the best. With this little of feedback here, again “interest” comes to mind, which this appears to be one hell of a lack of. Yes, lots of people read and don’t comment, but this is the one big thing everyone is obviously after and has been for so long now. Empty chairs do concern myself as well as what I’ve been hearing the management had major thoughts about when talking with JLT, or so he claims and I believe him. Ritchie’s not stupid for mentioning “a few might be interested.” And yes, that can happen to ANYONE who walks away and expects to walk right back in at a time of their own choosing, rather than when the demand is actually there and cooking. I can tell you the industry is not what it used to be, and promoters albeit pretty bad over the decades, have never had their heads further up their own asses in the history of rock, and most of it a sheer lack of experience, leading to heaps of a lack of interest and knowledge concerning what to do with such an enigma as Ritchie. He will need to be messing around very carefully when it comes to promoter interest, and that’s likely why festivals are being mentioned. As a single attraction in this economy, a much more complicated thing. This is now the second time that Ritchie has said he is doing a return to rock so it hardly sounds like he is winding people up. It is a temporary return,doing a small number of gigs and its quite clear (as it stands) that he is not going to reform Rainbow and go into the studio to do a new Rainbow/rock album. I can only hope that the number of dates that he is thinking about increases as the demand in Europe will be phenomenal. I was hoping for John Lawton, I always thought Ritchie and John would go great together. Morse is making a lot of money off YOUR WORK with Purple. The wisest thing for you to do is to COME BACK TO YOUR HOME GROUP, where YOUR HEART and LEGACY are. Niki @ 15- What is it with the studio booked & a new album rave? That was never mentioned at all. He does have the band sorted though, apparently. That is good enough me thinks. Cheers. LRT @ 17 – I would think that in today’s media savvy world, promotion is there for all & sundry. That & the fact Blackmore has such a full on history in classic rock. Plus, he has stated he is only playing 4 concerts, he isn’t announcing a world tour reunion of sorts! I think he will have no problem getting the attention desired for a positive outcome! Cheers. This is a very offensive comment. Without Steve we could only talk about a Deep Purple that existed some 21 years ago. There’s no one in the band who would appreciate a line-up change like this. Let’s not forget about the fact that TMIB got paid a buttload of money to carry on with Gillan for just a bit longer than a year after JLT had to leave. Deep Purple will most likely die before there’ll be another line-up change. And think about all the brilliant live recordings and orchestra projects that wouldn’t have been possible with TMIB for sure. To me it’s a shame that TMIB for whatever reason didn’t at least participate in the Concerto for Group and Orchestra studio recording. Jon needed three guitarists to replace him.